Why do cats groom each other? What does this behavior have to do with their big-cat cousins, maternal instincts, social bonding and hierarchies? If you have multiple cats at home, you’ve probably seen it happen on occasion. When it did, you undoubtedly smiled and said “Aww!” Your parental pride was triggered as one cat started licking and grooming the other. So, why do cats groom each other? Let’s take a closer look at this behavior. Why do cats groom each other? Let’s talk allogrooming. Why do cats groom each other? Let’s talk allogrooming. Photography ©Ilse Oberholzer | Getty Images. 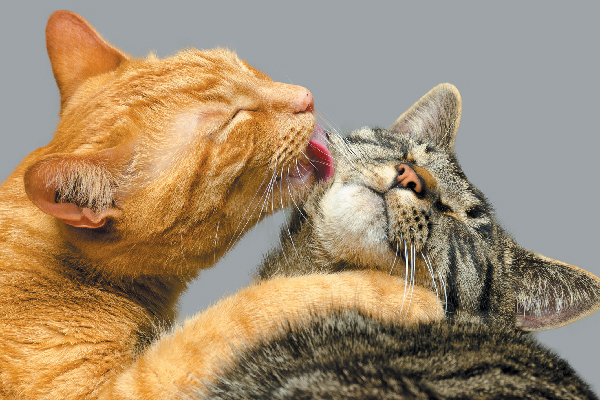 Before we start to answer the question, “Why do cats groom each other?” let’s learn about this feline behavior. Scientists call this adorable behavior allogrooming. But why do cats groom each other? Our human intuition tells us that this might be a sign of affection between our cats, but it’s not that simple. It’s complex enough that scientists have studied allogrooming behaviors in domestic cats, lions, primates and many other species. In a 2016 study called Sociality in cats: A comparative review published in the Journal of Veterinary Behavior, researchers from the University of Bristol in the U.K. found that allogrooming is one of three ways cats express cohesion in colonies. The other two ways are allorubbing and transmitting scent signals. Why do cats groom each other? A social bond. In a 2004 study, Social organization in the cat: a modern understanding, researchers from the University of Georgia observed feline social interactions in free-roaming cat colonies. They noticed that allogrooming occurs among cats who already have a social bond. Cats outside the colony are not recipients of allogrooming unless they are integrated into the colony. In other words, cats are not going to groom another cat they don’t know, which makes total sense. But there’s more to it than that. The researchers observed that recipients of allogrooming are usually highly cooperative, will tilt and/or rotate their head to provide access to the groomer, often while purring. 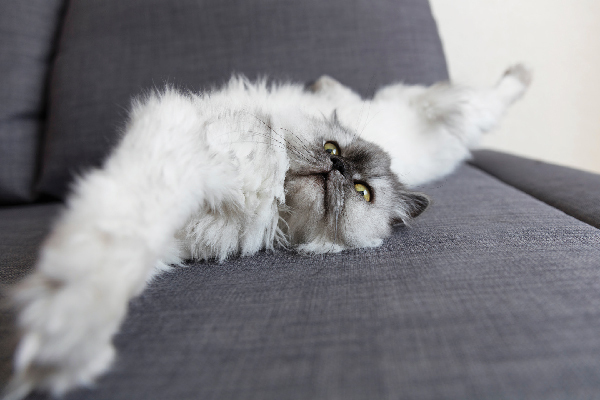 Cats might solicit allogrooming from another cat by approaching the other cat, flexing their neck, exposing the top of their head or back of their neck. This happens to be part of their bodies that cats cannot easily groom themselves, so this solicitation could be motivated by a practical need for help in the bathing department. Why do cats groom each other? It’s not necessarily reciprocated. Another interesting point to think about when asking, “Why do cats groom each other?” The researchers also observed that cats who have a closer bond usually engage in allogrooming and that it may or may not be reciprocated. They gave one specific example of a female cat with two of her adult offspring. Each cat groomed the other two cats over the course of several minutes and took turns helping each other out with their bathing needs. We can better learn how to treat our own cats by understanding allogrooming among colony cats, because these relationships are transferred to their relationships with humans. So when we pet and scratch our cats’ head and neck, we are in a sense grooming them in an area where they typically groom each other. You may have noticed that cats like it when their human pets them on the head and neck. But we also pet cats on other areas of their bodies that aren’t typically groomed during allogrooming. This could be a contributing factor in petting-induced aggression, the researchers concluded. Why do cats groom each other? It has to do with a higher rank. A 1998 British study from the University of Southampton called The function of allogrooming in domestic cats (Felis silvestris catus) also noted that allogroomers generally groomed the head and neck area. These researchers also observed that higher-ranking cats groomed lower-ranking cats more than the other way around. Allogroomers also took higher postures, that is, standing or sitting upright, while allogroomees were sitting or prostrate. And allogroomers showed offensive behavior more often than allogroomees, most often after grooming the other cat. Allogroomers often groomed themselves after grooming the other cat. The researchers hypothesized that allogrooming may be a way of redirecting potential aggression when displays of aggression might be too costly. In other words, the cat shows dominance by grooming the other cat rather than by picking a fight in which someone might get hurt. Why do cats groom each other? A maternal instinct might be at play. Why do cats groom each other? A maternal instinct might be at play. Photography ©grase | Getty Images. Another thing to consider when thinking, “Why do cats groom each other?” When kittens are born, they are met with their mother’s tongue. 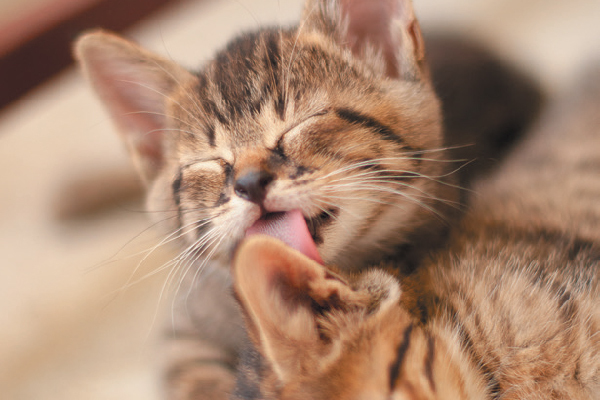 Kittens rely on their mothers for everything, including bathing. This behavior is both a sign of affection and protection from their mothers. Queens clean their babies immediately after they are born, because the smells associated with birth could draw predators. 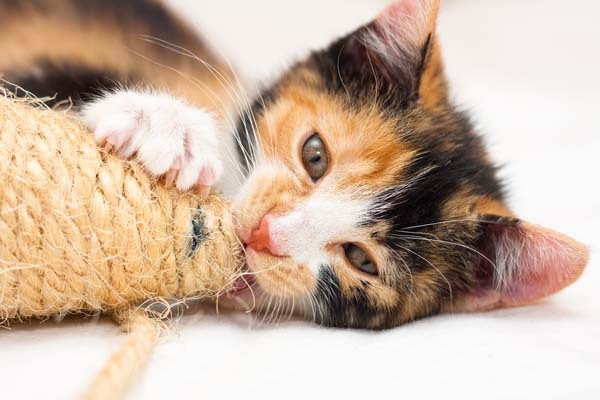 By the age of 4 weeks, kittens are able to bathe themselves, and they’ll spend as much as 50 percent of their lives keeping themselves clean. So, why do cats groom each other? Judging from the research, it appears to be a sign of social acceptance and connection. Cats neither groom nor solicit grooming from strangers. Because it’s usually to the head and neck, a part of their bodies they cannot reach themselves, allogrooming could be motivated by a practical need for help with bathing. Cats learn the behavior from their mothers, so maternal instinct likely plays a role. Allogrooming might even show social hierarchy — dominance for the allogroomer and submissiveness for the allogroomee. Even if allogrooming is motivated by aggression, it’s tempered by a social bond reserved for friends and family. 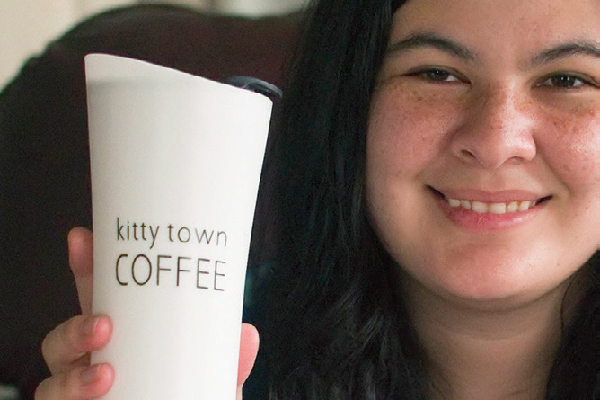 Author and editor Susan Logan-McCracken shares her home with her husband, Mark, and two red tabby domestic long-haired cats, Maddie and Sophie. My family has been witnessing allogrooming for a bit now and I have to say it’s pretty interesting and kinda cool. We were gifted with 6 kittens by a stray someone dumped off. Mama and her babies (sadly only 5 remain), who are now a year and a half old, became part of our family. The ‘babies’ as we call them constantly groom each other and on occasion will groom our older cats and a younger kitten. I’d never seen anything like it in my years of having cats. My 9 yr old female cat will lay down next to my male cat, who is about twice her size an d excessively groom his head then after about two minutes starts aggressively hissing at him then she quickly flees, he chases her and violently attacks her. This is starting to happen a lot! Why does she repeat this behavior when it keeps ending in violence! Our 11 year-old solid white male cat grooms our 5-pound , 3 year-old male Yorkie frequently. I wonder what that indicates. So I guess when our cat grooms us she is showing the traits described above? Sometimes it just takes time for a group to take in another. Be sure to give all kitties attention. I have a group of rescues with older and younger. Within the group some are willing to accept new family members others are more standoffish. One is so jealous I am surprised she hasn’t turn green. 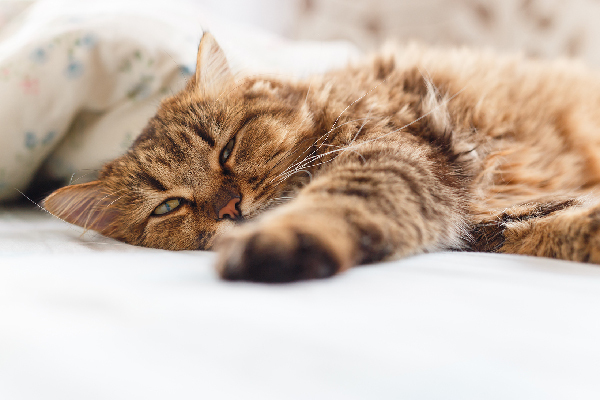 Did you allow your seniors to get used to the new cat by keeping him isolated, but visible for a couple of weeks? We introduced our new kittens by keeping them in a room not accessed by the two older cats. The older cats could sniff through the cracked door. You can also rub the newbie with towels, then leave the towels for the old ones to sniff and get used to. Cats need to get used to the scent of new members of the family. It takes a lot of time and patience to integrate new cats into the current cat family.